In January, the ECB tapered its bond buying from €60 billion per month to €30 billion per month. Equally as important, the central bank is expected to stop its bond buying completely by September 2018. 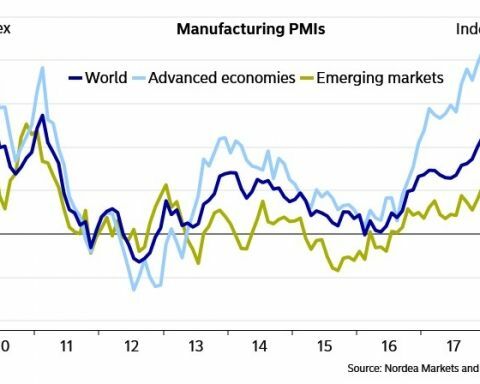 European economic growth has accelerated recently, but it’s unclear how much the economy was helped by the QE and how much it was helped by the global synchronized economic recovery. The ECB policymakers will, of course, take credit for the success. This is just like how Janet Yellen is praised for keeping the economy out of a recession as if she was the sole reason the economy stayed out of a recession rather than a piece of the puzzle. 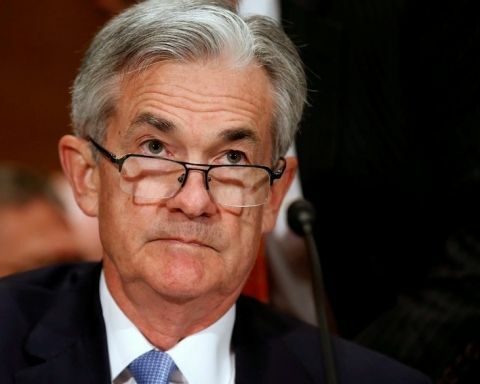 There are some analysts and personalities who over exaggerate what the Fed and other central banks have done because drama gets people talking. The ECB’s QE certainly had an effect on the market which we’ll discuss, but it’s safe to say those predicting Armageddon when QE ends will be disappointed. Most investors already know QE will end, so if Armageddon was going to happen, it would be here already. 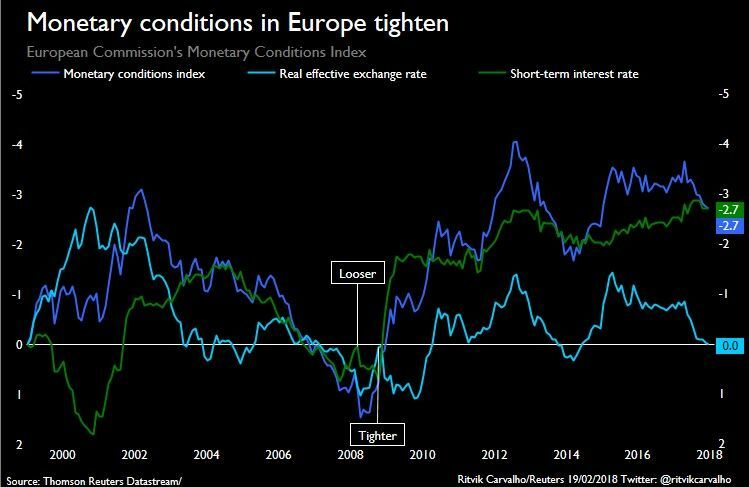 As you can see from the chart below, the monetary conditions index has tightened the most since 2014 which was right before the ECB started this round of QE. As we expected, the euro strengthened versus the dollar because of this unwind. It’s larger than the Fed’s QE. The Fed is shrinking its balance sheet, while the ECB is tapering its unwind, but the rate of change is important. The Fed just went from unwinding its balance sheet from $10 billion per month to $20 billion per month. The additional $10 billion is much smaller than additional €30 billion ECB taper. 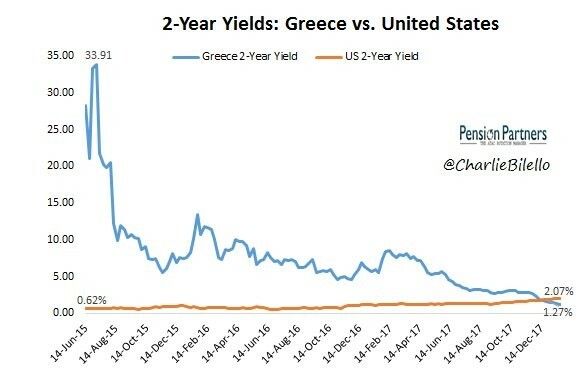 One of the most unusual aspects related to QE is the Greek 2 year bond yield has a lower yield than the US 2 year bond. The chart below shows the historical changes. The latest 2 year U.S. treasury yield is 2.25% and the latest Greek 2 year yield is 1.44%. A few years ago, there was fear Greece would leave the euro which is why the yield was 33.91%. The Greek debt to GDP is still excessive as it’s at 179%. However, with Germany backing Greece and with the ECB buying bonds, flattening the yields in every part of the economic bloc, Greek yields have fallen sharply. To be clear, when the ECB buys a certain cohort of bonds, the demand that was in that bond, flees to other bonds with higher yields and similar risk factors because they are now a better deal. Two other points are worth noting. The market has eliminated default risk in Greek bonds because it has been backed by the E.U. Now the low yields reflect low nominal GDP growth. Secondly, 80% of Greece’s outstanding debt is non-tradable. Greece’s debt stack has been converted to E.U. loans. The German 10 year bond yield is nearing 1% as you can see from the chart below. The 10 year German bond is going in the same direction as the U.S. 10 year bond yield. Both are going up because of increased growth and inflation expectations. They key off each other since they are both low risk fixed income investments. 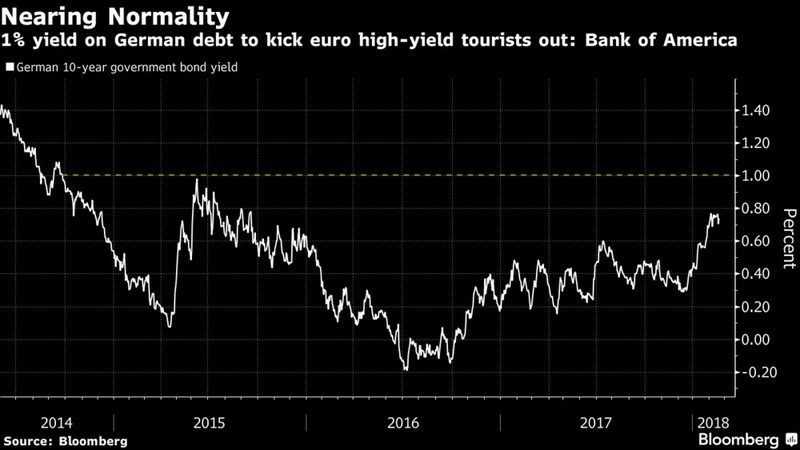 However, it costs 2.6% to dollar hedge the euro if US investors buy German bonds, so the situation doesn’t imply the bonds should have the same yield. The German 10 year bond is also being affected by the tapering of the ECB’s QE program. The line is drawn at 1% on the chart because that’s what money managers consider to be the line in the sand. That line would probably be 3% on the U.S. 10 year. The worry is that investors may start to sell out of corporate bonds and buy German bonds instead. All European bonds were affected by the ECB bond purchases. Any bond that wasn’t purchased was affected by the search for yield as investors were crowded out of the bonds the ECB purchased. 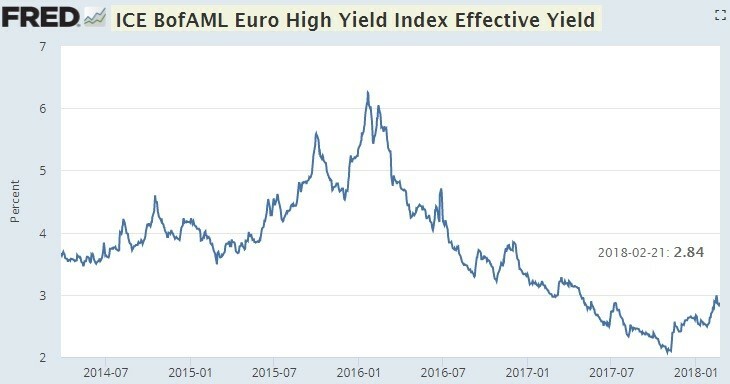 As you can see from the chart below, investors should be worried because the Bank of America euro high yield index hit a record low in late 2017. Up is virtually the only way to go when yields on junk debt are that low. There was a point where junk bonds yielded less than stocks which is almost unbelievable. For context, the trough in U.S. high yield debt in 2018 was 3.23%. That was the lowest yield since 2007. 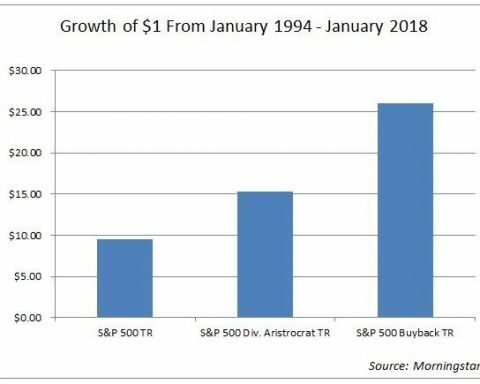 At that point in 2018, the S&P 500 had a dividend yield of 1.8%. This is just meant to show how unusual the European situation was. This also plays to discounting the TINA argument for stocks. Some investors and analysts say stocks are in a bubble because of low yields, but how could junk bonds have a higher yield than stocks if investors could just buy stocks? The answer is that bond and stock investors have different needs, so the two aren’t swapped. This furthers the point that when yields rise, stocks might not plummet in America. Valuations were higher in the 1990s, yet interest rates were also higher in the 1990s. The chart below shows the expectations for the major central banks. The Fed is expected to still have the highest interest rates in the next 9 months. The ECB is expected to finish the unwind before it raises rates in late 2018. The rate hike will probably be 10 basis points which is less than half the increments the Fed raises rates in. The rate hike expectations have been pulled forward as it was previously thought that the ECB wouldn’t raise rates until the end of 2019. 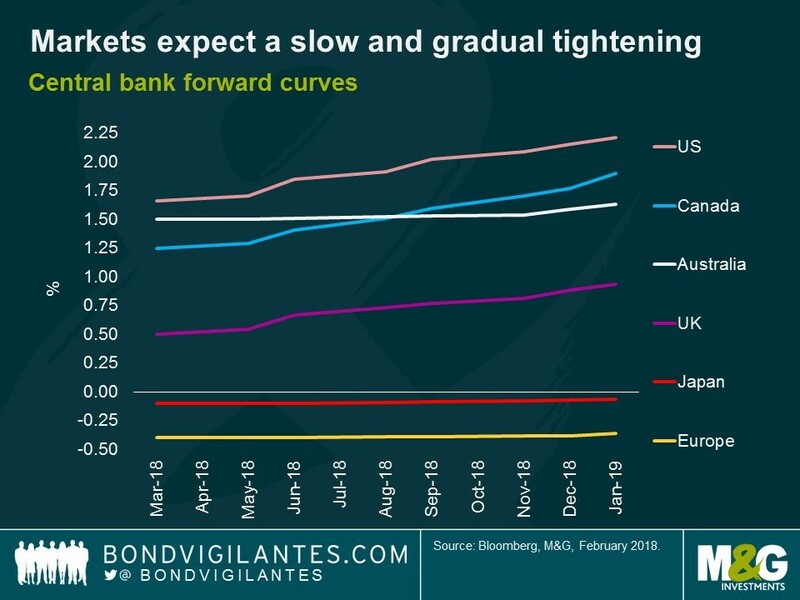 The QE end was also pulled forward from the end of 2018 to September. One factor to keep in mind is that Mario Draghi’s term as ECB president will end in October 2019. We’ll discuss who will replace him in future articles when the decision gets closer. The ECB’s QE unwind is pushing the German bond yield up. That will have a domino effect on corporate bonds. 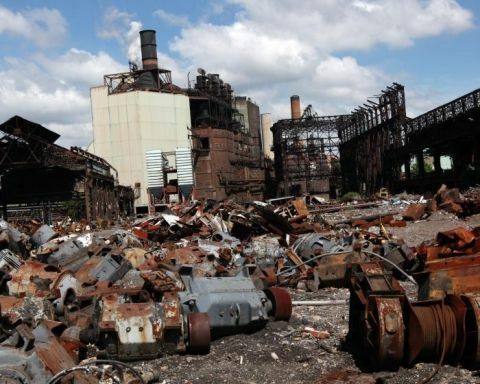 It could knock out some of the zombie companies which have only been surviving because borrowing rates have been so low. This is all actually good news because the markets are finally normalizing after a very long and arduous economic recovery. The number of government bonds with negative yields is declining. Unlike what those claiming Armageddon have stated, the end of the world has not come. While everything is working smoothly for central banks, the experiment is still not over. It’s an interesting concept to consider that the end of the world would come from positive yielding bonds when that scenario has existed throughout history. 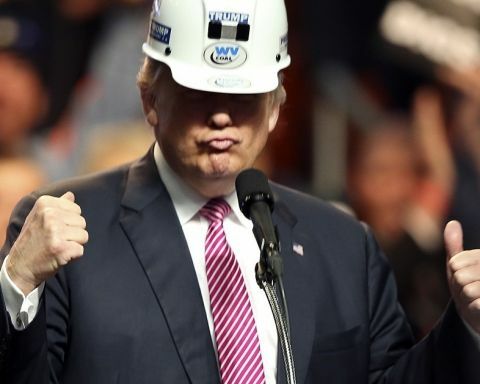 However, the difference this time of course is the amount of global debt and what has been already the third longest expansion, which may come to an end sooner than markets anticipate.